Text: Origins. The hymn “Must Jesus bear the cross alone” has a long, complex history with multiple influences and variants. The oldest form of this text appeared in Penitential Cries (London: Thomas Parkhurst, 1693), a collection started by John Mason (ca. 1845–1694) and finished by Thomas Shepherd (1665–1739). In this collection, Mason is credited only with the first six hymns and a paraphrase of Psalm 86; the rest are by Shepherd. The key text is “Lord, Thou hast planted me a vine,” by Shepherd, where the third stanza reads “Shall Simon bear thy cross alone” (Fig. 1). Fig. 1. Penitential Cries (1693). Text: First Adaptation. Shepherd’s hymn was not printed in American hymnals until almost one hundred years later, when it appeared in The Christian’s Duty (Germantown: Peter Leibert, 1791). This text took on a new form when it was recast as “Must Simon bear his cross alone” in Second Advent Hymns, Designed to Be Used in Prayer & Camp Meetings (1842 | 1843 ed. shown in Fig. 2). This collection was printed in different forms by different publishers, including M.M. George in Lowell, Massachusetts, A.R. Brown in Exeter, New Hampshire, and Joshua V. Himes (1805–1895) in Boston. The 1842 Himes edition, curiously, did not include this hymn; Himes introduced it into his own collections in a different form the following year. Fig. 2. Second Advent Hymns, Designed to Be Used in Prayer & Camp Meetings (Concord, N.H.: A.R. Brown, 1843). In this collection, published without music, the text was in three stanzas of four lines (8.6.8.6.). 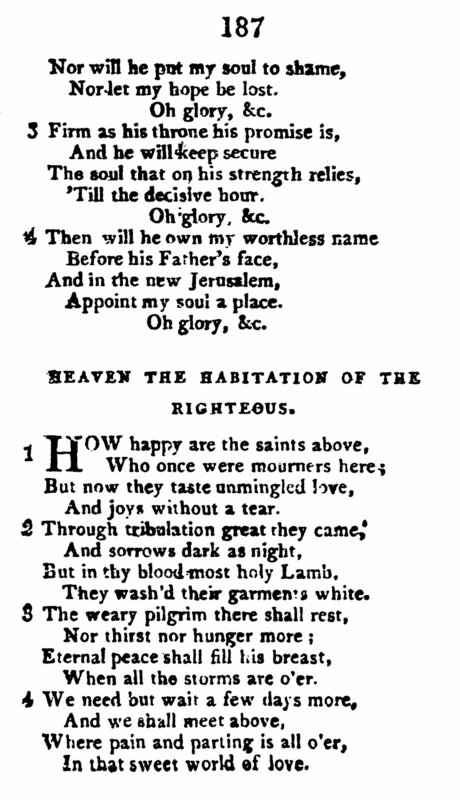 The first stanza is clearly an adaptation of Shepherd’s stanza “Shall Simon bear thy cross alone.” The second stanza, “How happy are the saints above,” appeared as early as 1806 in Hymns and Spiritual Songs, for the Use of Christians, 8th ed., enlarged (Philadelphia: Jacob Johnson, 1806 | Fig. 3), unattributed. The third stanza, “We’ll bear the consecrated cross,” has not been traced any earlier than Second Advent Hymns; the author is unknown. Fig. 3. Hymns and Spiritual Songs, for the Use of Christians, 8th ed., enlarged (Philadelphia: Jacob Johnson, 1806). Text: Second Adaptation. The Second Advent version of the hymn (Fig. 2) was published three times by Joshua V. Himes in 1843, but greatly expanded. One example appeared in Signs of the Times and Expositor of Prophecy, vol. 5, no. 12 (24 May 1843 | Fig. 4), p. 91, in four stanzas, headed “The cross and crown,” intended for a melody described as “The rose that all are praising.” Himes was one of the editors of the periodical. In this version, the three stanzas from Second Advent were extended from four lines to eight. An additional fourth stanza, “The church has heard the midnight cry,” seems to be without precedent and is probably by Himes. “The rose that all are praising” is a song by Thomas Haynes Bayly (1797–1837) (Baltimore: John Cole, n.d. | PDF). Fig. 4. Signs of the Times and Expositor of Prophecy, vol. 5, no. 12 (24 May 1843, p. 91. The hymn was also included in Joshua V. Himes’ Millennial Harp and Advent Meloodies (Boston, 1843 | Fig. 5). In this collection, which included the tune CROSS AND CROWN, the reason for the expansion of the each stanza to ten phrases (8.6.8.6.8.8.7.6.6.6.) is more clearly seen as a way to fill the tune (melody in the second voice). The melody bears a resemblance to Thomas Bayly’s “The rose that all are praising” (PDF), but it departs in many respects, in shape, in rhythm, and in length. Fig. 5. Joshua V. Hines, Millennial Harp and Advent Melodies (Boston, 1843). This printing was then repeated in Himes’ Millennial Harp, Improved Ed. (Boston, 1843), which was a compilation of three earlier collections: Millennial Harp, or Second Advent Hymns (1842), Millennial Harp and Advent Melodies (1843), and Millennial Musings (1841). Text: Third Adaptation. 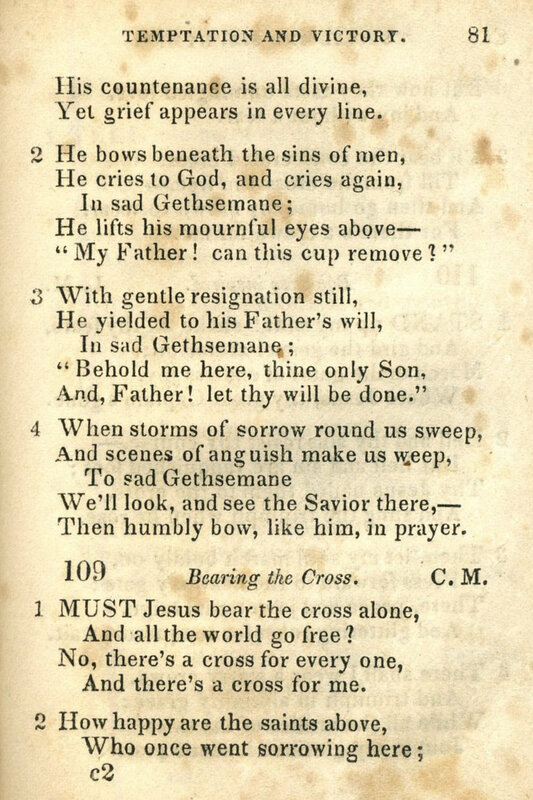 The Second Advent version of the hymn was altered as “Must Jesus bear the cross alone” in The Oberlin Social and Sabbath School Hymn Book (Oberlin: James M. Fitch, 1844; 1846 printing shown at Fig. 6), compiled by George N. Allen (1812–1877). Allen’s alterations were minimal, but notable. The first line shifted the burden of the cross from Simon to Jesus. The third stanza was changed from plural (“we”) to singular (“I”). Fig. 6. George N. Allen, The Oberlin Social and Sabbath School Hymn Book (Oberlin: James M. Fitch, 1846). Allen’s version of the hymn, therefore, should be credited to Thomas Shepherd, 1693 (st. 1), Hymns & Spiritual Songs, 8th ed., 1806 (st. 2), Second Advent Hymns, 1842 (st. 3), altered by G.N. Allen. Text: Additional Stanzas. Allen’s version of the hymn later appeared in Henry Ward Beecher’s Plymouth Collection of Hymns and Tunes (NY: A.S. Barnes, 1855 | Fig. 7). Beecher’s edition included three additional stanzas beginning “Upon the crystal pavement down.” These appeared without attribution but have been credited to Charles Beecher (1815–1900), Henry’s brother. Like Himes, Beecher named the melody CROSS AND CROWN, but this tune is completely different and should not be equated with the other. Fig. 7. Henry Ward Beecher, Plymouth Collection of Hymns and Tunes (NY: A.S. Barnes, 1855). John Julian, “Thomas Shepherd,” A Dictionary of Hymnology (London, 1892), pp. 1054-1055. “Must Jesus bear the cross alone,” A Dictionary of Hymnology, with Appendix, ed. John Julian (London, 1907), p. 1581. Robert Guy McCutchan, “Must Jesus bear the cross alone,” Our Hymnody: A Manual of the Methodist Hymnal, 2nd ed. (Nashville: Abingdon-Cokesbury, 1942), pp. 313-314. Fred D. Gealy & Austin C. Lovelace, “Must Jesus bear the cross alone,” Companion to the Hymnal (Nashville: Abingdon, 1970), pp. 287-289. Paul G. Hammond, “Must Jesus bear the cross alone,” Handbook to the Baptist Hymnal (Nashville: Convention Press, 1992), pp. 190-191.